We’ve been chipifying everything from the produce department since that first brave soul decided to see what roasting would do to kale leaves a decade or so ago. The kale chip has been joined, over time, by the carrot chip, parsnip chip, zucchini chip, butternut chip, beet chip, turnip chip and anything else creative home cooks could get their hands on. Whether in home or commercial kitchens, roasting and toasting thin vegetables to crispy perfection is a certifiable thing. Last year for October Unprocessed, I showed you how to make baby bok choy chips. If you haven’t tried that yet, I encourage you to break free of your kale chip obsession and give bok choy a whirl. 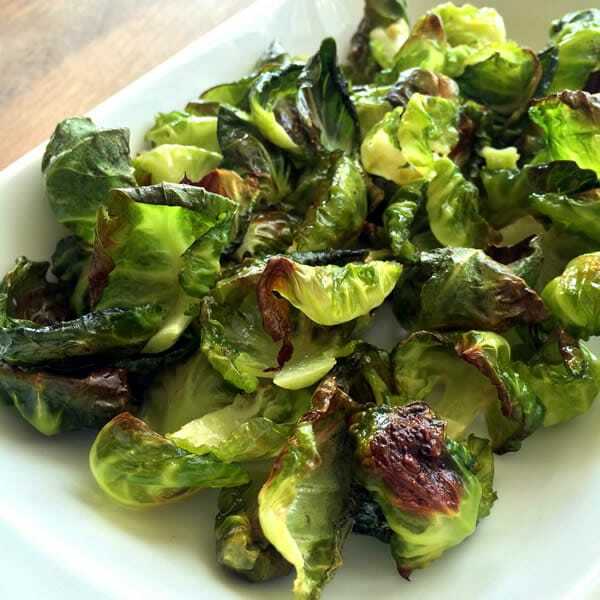 And if you’re ready to move on to the next chip today, let’s make Brussels sprout chips. Yeah, America’s most hated vegetable — the one people despise before they even try it — is actually GREAT when you chipify it. Sure, this vegetable villain can be bitter or sulfurous when cooked too long, but it’s a nutritional powerhouse, which trumps its stinky reputation. 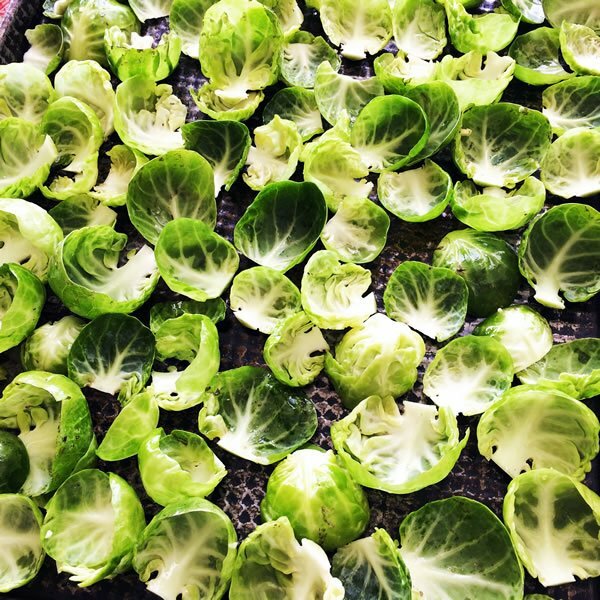 Cruciferous Brussels sprouts support the body’s detox, antioxidant and anti-inflammatory systems — three systems closely associated with cancer prevention. Pros: Nutrient-dense, high-fiber, low-calorie, gluten-free, Paleo, vegan, very low on the Glycemic Index, no saturated fat or cholesterol. And did I mention delicious? Con: Bad word-of-mouth. You’ll have to convince the sprout haters to try them. Let’s see if we can turn around Brussels sprouts’ image using this one chip-making technique, without using a fancy PR firm to do it. Move over kale, there's a new chip in town! Crispy Brussels sprouts chips will convert even sprout haters. When you have removed all leaves you can, toss the leaves gently with the oil, sprinkle ever so lightly with salt. (Really, do NOT have a heavy hand with the salt because the salty flavor intensifies with roasting. Just sift a few grains between your thumb and forefinger.) Lay leaves in one layer on a rimmed baking sheet. The leaves, during tossing, will want to cup together, so take care to remove them from nesting together as you arrange them on the baking sheet. They need to toast in one layer for best results. Roast for 10-15 minutes, until leaves are lightly browned and crisp. The wide variation in time is because of the differences between home ovens. Check at 10 minutes, and remove any that you think are done, putting the rest back in for another minute or 2; check again and remove those that are done. You don't want the entire leaf to be fully toasted or it will be too bitter. You'll get the hang of it and your oven's peculiarities after the first batch. We don’t go for the BS much around here–but I have them on my shopping list to buy today! Whenever I do cook with them I love them. New habits need to be formed in the cruciferous department. I think I’ll get more than I was planning and try these. Letty, you are so right! We all need to branch out and keep trying new cruciferous things. There is life beyond broccoli, eh? I find that even people who think they don’t like B. s. (probably because they had them boiled in the past) like these chippy things. They are also great (and don’t take as much watching-so-they-don’t-burn) roasted. Trim, cut the larger ones in half, toss with a little olive oil, minced onion, and orange juice or peel; bake for 45 min to an hour at 350 deg. F., or 20 min to 1/2 hour at 450 deg., depending on what the rest of your meal takes. Yum. Thanks for another idea Sandy! Love them roasted, as well. Yum! 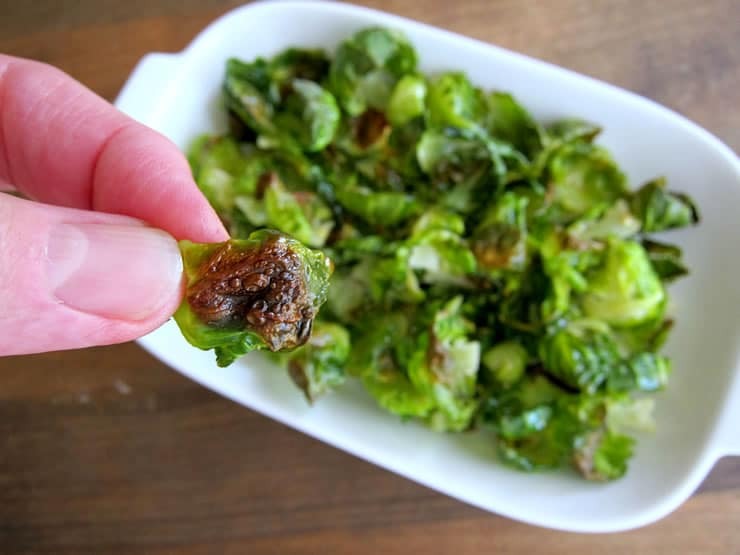 I looooove brussels sprouts, especially when they’re nice and crispy! Ashley, don’t they just transform into something quite wonderful when they get crispy? This is one of my favorite snacks I started making last year! Great recipe to share!! Thanks Susan! What else have YOU chipified that I need to try?